Because no ones knows you better than your best friends, say “yes” when one of your girls wants to set you up on a blind date. Start with a phone call. Let her pass along your number to get the ball rolling on introductions. A few text messages are fine, but make it clear that you'd love him to call before your date. This allows you both to get to know each other a bit beforehand. You may find you already have things in common and it will make for less awkward silences on the big night out. Facebook stalk him. You don't need me to even list this, right? Doing a little online PI work is normal. Who doesn't Google a blind date? 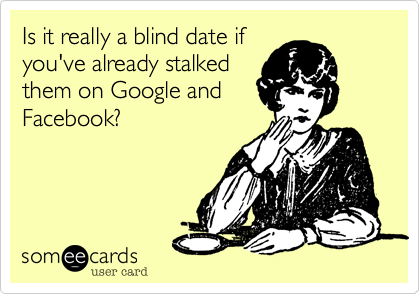 Or at least have your friend email you a photo, so you can see if you're attracted from the start. Throw out all expectations. Even if you had an amazing two-hour phone conversation before your date, you can't expect Ryan Gosling (or whoever your Mr. Perfect is) to arrive at your door. Just keep yourself busy leading up to it, for less time to obsess over him and the possibilities. You'll most likely be pleasantly surprised. Dress to impress. Wear something you love. Something that makes you feel confident. Whether you shop for a new LBD or just want to wear your favorite skinny jeans and heeled booties, it's important you feel your best. Follow Patti Stanger’s drink minimum. Millionaire Matchmaker’s feisty star is know to advise her clients not to drink more than two cocktails on a date for clarity. But, two drinks isn’t much - especially if it’s a long date and you're eating dinner. Depending on your tolerance, what you dine on and how many hours you're out chatting, go for the amount of drinks that works for you personally, whether that's two or four. Ask questions. You don’t want to feel like you’re on an interview, but you must ask questions to learn more about him. If you’re usually chatty and the center of attention, try to pull back a bit so he can share his thoughts and experiences. Keep an open mind. Don't be quick to judge - because you can't find out everything about a new guy on your first meeting. It's important to remember that chemistry can grow and some people are just plain nervous on dates. Give him the benefit of the doubt - and maybe even a second date - if there is potential. Don’t be negative. Because no one likes a Debbie Downer, stay positive and keep things light. But if it goes horribly wrong? Go here for tips on how to escape a bad date.